This Rock ‘n’ Roll redhead will get you hot under the collar with her sizzling stage presence and megawatt smile. 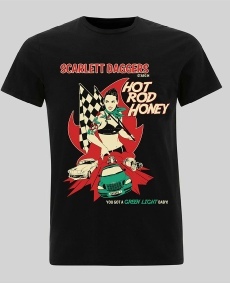 From a Hot Rod greaser-girl to a B movie Cobra Queen and even Robin Hood, Scarlett certainly stands out from the crowd. Performing across the UK, and internationally, for over ten years, her unique acts place her in high demand. La Dé Da Cabaret in Derby, The Wet Spot in Leeds and Dr Sketchys Nottingham. For more information and to book tickets see the Shows and Calendar tabs above. Scarlett is available to perform at burlesque and cabaret events, private parties and corporate events, is fully insured and a member of Equity. Please contact her to discuss a booking. T-shirts designed by Jake Gumbleton.